Travel Media Applications is the only company in South East Europe specialised in providing integrated services in marketing, sales and communication exlusively for the travel and tourism industry using latest technology and internet applications. We are always proud to present our projects. In this case, however, we will let someone else do that for us. Phil Butler, a good friend of us, from Argophilia Travel News, who wrote a very warm article about it! Pyramis International is a tour operator located in Athens, dealing mostly with outbound holiday packages. The expansion of his activities in incoming tourism demanded a new website for this purpose, containing both b2b and b2c applications. Navigator Travel is the representative of Royal Carribean and other significant cruise lines for Greece and other countries. This is the website we designed for them in 2009. Hydra Travel was our very first website for a travel agency in Greece, back in 2000 and was the first Greek website with active holiday packages. This is the 2008 redesign, awarded by HATTA. The Athens office of the famous brand is responsible for Greece, Bulgaria, Romania and Armenia and wanted their website to follow the "look and feel" of the brand. Launched in 2008. Laganas in Zante has a virtual tourism office now. The popular destination has launched a simple yet effective website and potential travelers can get all the information they need and more ! Launched in 2009. We are always in search of products, applications and services for enforcing the sales, marketing and communication of travel enterprises and destinations. As of April 1st 2011, Travel Media Applications is official representative of the Belgrade Tourism Board for Greece. Travel Media Applications is the official representative of the Tourism Board of the Czech Republic from summer 2009 till the end of 2011. .travel is an Internet domain specifically for the travel and tourism industry. Travel businesses and organizations can use .travel for e-commerce and promotion of their products and services with a .travel website, blog, and email. A successful workshop for India was organized by T.M.A. in Athens. As usually with T.M.A. events, it turned out to be a high quality event that received very positive comments, from everyone involved! T.M.A. has been chosen by Travelport to organize a series of workshops in Greece (more specifically in Athens, Thessaloniki, Crete) as well as in Cyprus. The global distribution giant will showcase its new products and services for the travel trade. Travel Media Applications, organised two very interesting workshops for the Vienna Tourism Board, in Athens (21st Sept.,2011) and Thessaloniki (22nd Sept.,2011) for the promotion of this prestigious destination. The 1st Greek Roadshow in Scandinavian countries was the first organized “expedition” of tourism entities from Greece (apart from travel fairs). After many years of absence from these countries, 30 destinations and enterprises, participated in this Roadshow, organized by Destination Travel Specialists, daughter Company of Travel Media Applications, from 1 to 5 of February 2010. Since 2005, Travel Media Applications organises its own group of buyers for the famous IMEX exhibition, in Frankfurt. The renowned MICE exhibition hosts our group of 12-15 buyers from Greece and the region, each year. Travel Media Applications is handling a hosted buyers programme for EIBTM, a very important M.I.C.E. exhibition. ΕΙΒΤΜ, one of the most important travel exhibitions in the world, hosts over 3.000 selected hosted buyers. Ever since 2006 , Travel Media Applications organises a hosted buyers team for the annual PATA Travel Mart, the official event organised by PATA (Pacific Asia Travel Association), a major exhibition for anyone interested in this region. 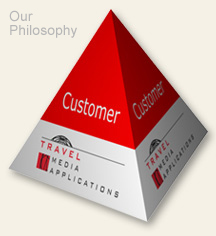 Travel Media Applications organises annualy since 2006, a hosted buyers group for the most significant M.I.C.E. exhibition in Asia, the IT & CMA whish is held in parallel with CTW. Travel Media Applications organised the forum "Culture and Tourism - eDevelopment" On Friday, May 8, 2009, dedicated to development of tourism and culture using the web and presented some of the best practices in these fields.